I’m aware that recently I’ve mentioned “soon” or “next week” or “keep your eyes peeled” often in regards to updates, and even though each time those words had the best intentions behind them, they still wound up falling flat. Time after time. After so long of being unable to provide anything of substance so many times, I decided keeping my mouth shut was the lesser of two evils. I hate making promises I can’t deliver on. You won’t see any promises being made in this blog post either, but that’s not the point. The point is to fill you in on the past several months, I owe you that much. More than that much to be honest, but this will have to do for now. In these months a lot of things at OP have been changing. This post should hopefully fill in the blanks for any questions you might have, so please stay a while and listen. First and foremost, in an effort of complete transparency on my behalf, my job duties are changing. I’ll no longer be handling the logistics of delivering physical rewards / prizes from contests, etc. Mainly because I don’t feel I was able to keep up with some of them. I care about this community and I want what is best for them, this means if I have to swallow my pride and ask someone else to step in and help then that’s what I’ve got to do. I am tying off loose ends as we speak such as CotY prize distribution, along with other packages from contests and raffles that are long overdue for mailing out. Overall it’s just proved to be too cumbersome for me to juggle along with everything else that I do, not to mention not having adequate space to store all of these T-shirts! We are undecided yet as to who will fill this role, but we’ll get it worked out and back on track in the coming months. What my job duties are going to be moving forward will be much more focused on community interaction and growth, and helping shape the direction of the site. Speaking of the direction of the site, you may be wondering why that’s something I’m going to be in charge of. Well I’d be lying if I told you I wasn’t sad to bring this news to you all, but Micah is no longer with Obsidian Portal. His reasons for departing from the site are his own and if you care to know more I suggest you reach out to him personally, I won’t be answering questions on his behalf or speaking for him in any way. What you should know is that that he did leave on good terms and is still in contact with the folks who now handle the development and upkeep of the site in order to make this transition smooth. Travis and myself are still here, as are a whole new host of helpful folks who are going to help get stretch goals knocked out, bugs fixed, and a bright future to look forward to. Yeah, stretch goals. Let’s talk about those why don’t we? Over the years I’ve learned the virtues of under-promising and over-delivering, which is exactly what we thought we were doing with some of our Kickstarter Stretch goals. We never wanted to make any big flashy statements, and always tried to be reserved with what we announced. Each and every stretch goal went over meticulous consideration and were measured out accordingly, at least we thought. Somehow still fell short. We are aware that some of them are long overdue. Luckily, Obsidian Portal’s new owners are dedicated to making sure a development team gets assigned to knock these goals out very soon. The only thing I’d like to add here is that we’re going to need names from you guys. Per feedback in the forums I believe we’re going to be sending out a Kickstarter survey asking for some names. This is a great way to get you guys re-involved and also makes is super easy for us to pull them in and import them into a database. I’m aware that during the Kickstarter we could have done many things differently. We should have beta tested more, longer, with a wider spread of users. We should have kept regular updates on the KS page after the campaign was over instead of assuming everyone listened to our podcast. There are a lot of things I could sit here and nitpick, but what I want to focus on here is moving forward. I want to acknowledge those mistakes publicly yes, we messed up. But we really care, and we’re really dedicated to righting our wrongs and getting things back in action. As a bit of an aside, here’s a fun fact for you guys, it’s not something a lot of people know. Obsidian Portal has never been more than 4 people up until very recently (the acquisition). At first it was just Micah and Ryan, then myself, then travis. I know a lot of people are under the impression that there were dozens of us. That being said, the inability to handle the sheer influx of information at times (feedback, bug reports, support tickets, feature requests, Kickstarter, etc.) could get overwhelming, especially since all of us all hold full time day-jobs. Luckily though, those days have changed and we now have the backing of a full size company to help get things coded, patched, tested, and implemented. I’ve been with OP for over 4 years now, I came onto the site as a fan and wound up helping out. That turned into a job and now it’s turned into helping steer the Obsidian ship in the direction I want to see it go. I can’t do this without you guys though, I’ve never been able to do any of it without you. Obsidian Portal is a great place, and I want to make sure it keeps on getting better. Here are some of my goals I’ve presented to the new team for moving forward, these are of course after Kickstarter stretch goals are met and bugs are squashed. Once again these are not promises, but things I’d really like to see us accomplish in the near future. There’s of course more than that, but some of them may be too pie in the sky for right now, and others may be things I dare not say aloud unless some of you get way too excited about them! That’s it for this mini-novel, I’ll see you guys around the forums, twitter, facebook, and everywhere else! Thanks for the information. A great post. and although some reasons are vague, I am willing to let it go and hang around. Thanks for the update. There is a lot to take in but the main thing is that something has been communicated at last and for that I (and I presume many others) am grateful. I’ll roll with the punches and keep on enjoying the site and its benefits. Kudos for saying things we had already guessed at; we just wanted to know there were still people behind the servers. What can you tell us about the acquisition company? Thank you for posting and providing us some insight into what is going on. I will again mention that if you want some help with PM in regard to communication and tracking progress please reach out to me. As for name generator my best suggestion is to look at the software package “Everchanging Book of Names” http://ebon.pyorre.net/. It provides a large amount of functionality and you might be able to utilize it. Thanks for that Bluesguy, I appreciate the offered help and rest assured I’ll be trying to leverage it a lot more in the near future than previously. Also, looks like the book of names there is pretty awesome, definitely going to pass this over to the dev team! This is exactly what all of us have been waiting for Jerry, and you nailed it. The details, frankly, are none of our business- the path forward is. I echo Bluesguy- anything I can do to help I will. 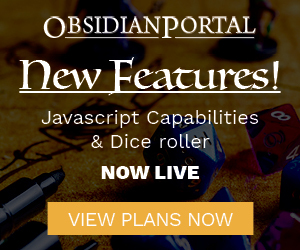 I have been a long time proponent of Obsidian Portal, and now that it is moving forward again I will go back to pushing it at Cons and among any roleplayers I come across. A long while back you said that I would take Arsheesh’s place as a forum moderator- still willing to do that as well. Yup, killervp said it better than I did. What Killervp said and then some I look forward to a long stay here. I agree with KillerVP, but like Bortas, I would love more info on the company that acquired OP. Just to clarify, even following the link Kaleidoscope link (http://kaleidoscopeglobal.com/) doesn’t tell me much about the company, other than it is a collection of entrepreneurs. Their homepage is just a picture, their About page is not that informative regarding what the company really does or what that means to OP, and their Blog page is either broken or simply doesn’t exist (content error is “Sorry, this page does not exist”). This information emptiness makes it difficult to get a sense of who is really in charge of OP now. Thanks for the update, it’s a relief knowing that folks are still working on OP. This should make my group happy as well, a few of us are Ascendant members and at least one of them has mentioned being disappointed after the Reforge since the communication dropped out. Before today I actually had no idea that the podcast was used to convey Reforge news (among other things), I almost never listen to them since I find reading to be faster. Same – I had no idea the Podcast conveyed news, I’m also the type that looks for written word. Like all who have posted comments, I appreciate the news. But the proof is in the pudding. The new owners have an opportunity to generate goodwill by delivering the stretch goals. I hope they understand the risk of not delivering on our pledges – both for them and your reputation as spokesman, Jerry. Thank you. I am optimistic and wish you the best. Jerry, in my opinion Micah not only dropped the ball but smashed it. Before the Kickstarter I thought it was a great place and recommended it to everyone. After the Kickstarter revamp and over a year of no word from anyone despite everyone’s pleas I gave up and stopped throwing my money away. Your words are encouraging and I truly hope that is more than words and that you and the crew succeed. I believe that with a passionate person at the helm willing to work with everyone including the users that the site can once again be as great as it was before the Kickstarter and even better. Best of luck. Thanks for breaking the silence. I’ve got a lot more confidence in things and am looking forward to seeing what comes next.